Our industry is well aware of the cleaning and grooming tasks that most ant species do so well — it’s a great way of spreading chemical, in fact. 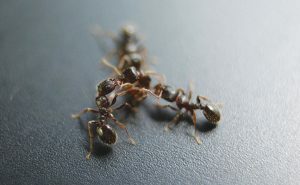 What sometimes thwarts ant control treatment, though, is how some colonies regularly segregate sick or dead ants from the nest. “We also know that ants also produce their own antimicrobials in bodily secretions,” TheConversation.com article points out. “Now, researchers have tried to work out what affects how these chemicals are made. In a new study published in the journal Royal Society Open Science, researchers from Arizona State University investigated the antimicrobial activity of 20 ant species in the US living in nests with between 80 and 220,000 inhabitants. “The researchers predicted that larger nest species would produce more effective antimicrobials, because of a greater risk of coming into contact with disease. Testing external secretions against Staphylococcus epidermidis, a common bacterium not known to cause disease, showed that 60 percent of the ant species produced secretions with antimicrobial activity. But, surprisingly, 40 percent didn’t produce an antimicrobial that could kill the bacterium.